Lithuanian Heavy Draughts are a draught horse breed created in Lithuania during the 19th and 20th centuries. They were developed by crossing local Zhmud mares with Ardennes, Percheron, Brabant, and other heavy breeds. In Lithuania draught capacity testing began in 1857, and since 2002 the Lithuanian Horse Breeders Association has taken over the responsibility of heavy horse testing. Recently, more have begun to be exported for meat. They are also used to improve other breeds. When crossed with native Altai horses, they improved the meat and milk yield and also increased the weight, growth rate, and ability to withstand year-round grazing conditions. Initially, Lithuanian Heavy Draughts were included into herd books as Ardennes crossbreds. A breed-specific herd book was issued from 1951 to 1996. The herd books for Lithuanian Heavy Draughts are now issued by the Lithuanian Horse Breeders Association, with purebred Lithuanian Draughts identified by their colour, conformation, and markings. In 1964 there were 62,000 Lithuanian Heavy Draughts in Lithuania. Recently, there has been a dramatic decrease in the breed population, with stallion numbers declining and breeding and working conditions deteriorating. Currently, the breed is close to extinction, with less than 1000 horses thought to exist as of 2003. 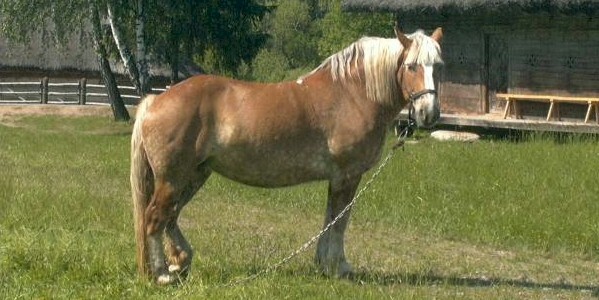 Lithuanian Heavy Draught horses generally stand 15 to 16 hands high, and may be bay, chestnut, black, grey or roan. Their head is well-proportioned with a straight profile and heavy jaw. Their neck is short, muscular, and arched, their withers are broad and moderately pronounced and their is chest wide, deep and muscular. Their back is long, and generally straight, although it can be slightly dipped, and the croup rounded, long and muscled. Their legs are short, solid, and muscular with broad, strong joints and well-formed hooves. Defects occasionally shown include a coarse head and an excessively dipped back.